Along and tedious bus ride turns into a sometimes-funny and often-revealing adventure for four West Virginia school children who begin to explore a timeworn mining town in the state’s southern coalfields. Leaving the march to the grownups, the four children split off only to be confronted by a boy whose father works for a coal company and another from a family being forced from their home by the mining operations. At the edge of a wood they stumble upon a weathered cabin and encounter an extraordinary woman who witnessed the first battle ninety years earlier and fights to this day to save her precious mountain. Nibbling the old lady’s homemade bread and sipping her sassafras root beer, the children begin to ask about her life as a coal miner’s daughter. What unfolds is a compelling tale unlike any the four schoolmates have ever heard. They come away from the visit with an understanding of life in coal country no classroom can provide. 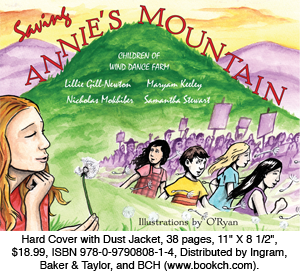 Written for children by children, Saving Annie’s Mountain is a remarkable story of fortitude and resilience in the heart of the Appalachians. "I have been alarmed for years now to see how many young people seem disinterested in politics and in participating in elections which have such a huge influence on how our lives shape up. Yet I have discovered some good news recently about the interests of the young that is really life-affirming. Four teen-agers in West Virginia have just written a book about the environmental and social implications of the mining that is so consequential in their state. And this is no school kid treatise….The book, Saving Annie's Mountain, is based on real events, dramatic and far reaching events….I urge you to read this book. It is delightful, it is fun to read and what it says matters. " —Tony Smith, author of Parzival’s Briefcase and, forthcoming, Falling In Love With Life Again. Forest creatures challenge sharp eyes to find their hiding places. Children’s original poems offer clues. A secret world of sights and sounds unfolds for young readers, non-readers, and parents too. Midwest Book Review calls it an “unforgettable read-aloud treasure."